It’s winter here as I write this and I can see the snowy effects in the trees outside the window as I type this blog. Whenever we get this weather, it reminds me of our time in Kazakstan when we went for a month 3 years ago to get our daughter, Emily. While it was a different culture, my wife and I find ourselves homesick from time to time for a place we only spent a month. One of the things I found interesting while we were there was our trips to a couple of the local churches. 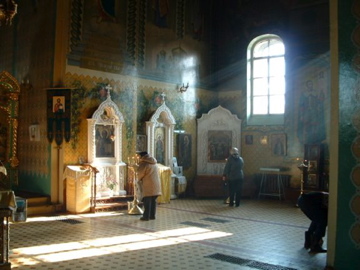 There are two prominent options there when it comes to places of worship, Muslim temples and Russian Orthodox churches. Being a Christian, we opted to visit two of the churches during our time there and it was quite different than what I am used to. The churches are generally one main, huge room that are a couple stories high and very wide. When I went through my pastoral studies, my worship teacher would say it was designed to portray the awe and wonder of God more than create an enviroment for feeling close to Him and each other. There are many, many religious artifacts scattered about that would take the whole day with a tour guide to understand the purpose, history, and symbolism of each. There are no chairs except for one row of wooden chairs in the back of the room for older guests. It is not the most welcoming place though it is breath taking. The other observation that you could not miss was the amount of “icons” in the room. Almost every square inch of the walls were covered with pictures like the one I have added to this post (original post at www.tomhypes.com) There were pictures of every scene and saint from the Bible. We were even able to buy an “icon” of Jesus at the church to bring home for Emily’s room as a memory. It was an impressive site. We were blessed to be able to view one of the services at one of the churches while we were there. Watching this event made me even more aware of the differences between us and them in our worship. 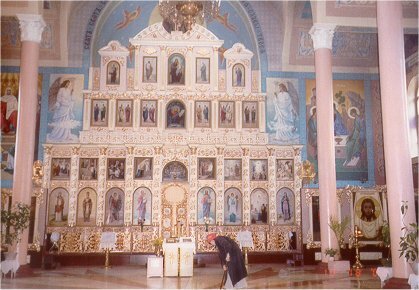 If you were to go to one of their services, you would first find an “icon” that you relate to and stand in front of it. While staring at it, the priest starts his readings as he walks about with incense. At the proper time, those attending recite their parts to the readings or the singers, hidden away in the back, sing their part. Then, when the priest is done, he heads back out through a door in the back and those attending head back out into the streets. At no time, was there a time of interaction between the priest and/or the people. Come in, play your part, and leave. Our translator (who we love dearly) and our driver where very interested in knowing a little bit more about what church was like in our world. One afternoon, they came over to our apartment and we showed them pictures and played them music of the worship team we had at the church at the time. They were amazed at the contemporary music, the casual dress, and the scenes of people interacting with one another in a relational way. At one point, our driver who could speak very little english looked at a picture of two guys talking and holding coffee and asked me “Beer?” No, Misha…not beer but I could understand that to him, our church was so different it reminded him more of a night club than the Russian Orthodox churches on his block. It was hard to be in a place where worship and God were not considered relational; to not have interaction and real experiences with one another. Christian community is one of the gifts of our God to His children to encourage and interact with one another. More than that, the Word makes it very clear it is to be part of life and how it should work. However, I see something similar to this mentality happening here in the States today. The only difference is the icons are replaced with computer monitors and/or TV screens. So many people have given up on the church and now find their Christian education or cheerleading boost from a podcast or TV show. They get set up, listen to the preacher do his thing, hear the music come across the speakers from the singers at a distance, and then when it’s done….the screen goes blank with the preacher going away and you’re back to your day without any interaction within the family. If you looking for a little more knowledge, then I guess this works. If you’re looking for a life more abundant within the family of God…you’re missing something when you do not invest into community. I know that finding a church can be a hard thing, especially if you have been hurt before. I know that trusting others can be an overwhelming thought, especially when others have betrayed you before. However, it is so worth it once you find it! So worth it! If you are looking for a church, we’d love to have you visit us (www.theshepherdsfellowship.org) or have you touch base with me about other churches in the Marion, Ohio area. If you are outside of Marion, still touch base if you wish and can give you some ideas of what to look for in finding a church family. Would love to help any way we can…. Blessings!